Some Myrtle Beach golf packages are put together in a couple of days, and some are crafted by a very thorough group leader over the process of weeks, or months. Some are for a few days, some are over a period of a week. Regardless of how long they take to plan, the best Myrtle Beach golf packages all have one thing in common: good times and great rounds of golf. Many golfers who've never been to Myrtle Beach often think that it's a resort, like Broadmoor in Colorado, when in fact it's nothing like that. Myrtle Beach is the seaside golf capital. It can seem overwhelming at first, especially if you don't know your way around. There are a couple things that might surprise you about Myrtle Beach. The Grand Strand is larger than it looks on the maps, stretching along 60 miles of coastline from North Carolina all the way to Georgetown, SC. The second surprise will help you make your planning the best Myrtle Beach golf package easy. So many of the 100+ golf courses are terrific. The greens at the golf courses in Myrtle Beach are generally in good shape, especially due to the short winter season. There are lots of great places to play, and most of them won't cost an arm or leg, especially when you plan your Myrtle Beach golf package for the off season. Even during the peak golf season, the best Myrtle Beach golf packages could be cheaper than playing a course at home. The main appeal of Myrtle Beach is not that it's such a bargain, but that it's devoted to the golfing fantasies of the average golfer. Tee times and bar seats are plentiful, good used golf balls are easier to find than seashells, and everything is divisible by four. Best of all, for a golf-starved visitor at certain times of the year, Myrtle Beach is a reminder that summer will be back in almost no time at all. 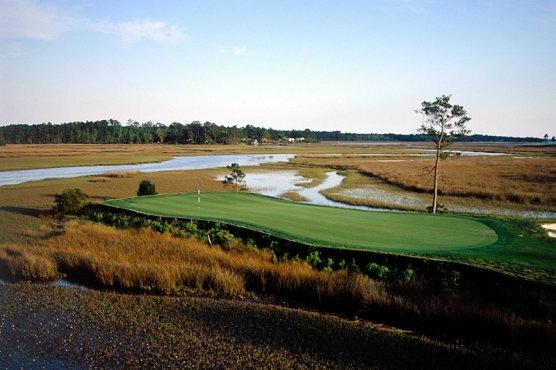 The best Myrtle Beach golf packages are easy to find and book. Book a Myrtle Beach golf package on our website, or call us to customize your perfect golf vacation today.